So the other night I came home a little later than normal. I lugged myself, baby and mail into the house and situated Isaac with his favorite toys as I went through the mail. I didn't know what to make, as I haven't gone real grocery shopping in at least a month, and there was no rush anyway because Tony wouldn't be home for awhile. A personal card had caught my eye as I'd walked up the driveway, but waited to open it until last, assuming it was a late birthday card for Isaac. A bill of course drew my attention, and as I searched the due date I almost forgot about the fun piece of mail. As I turned the letter over my mind was elsewhere, only focusing on the task at hand when I noticed that the envelope was unsealed, which always alarms me. 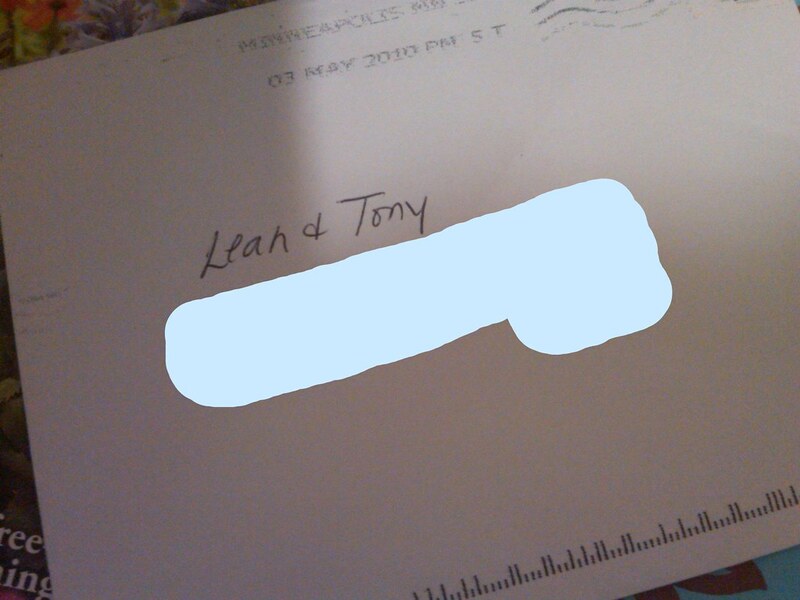 Weird too was the fact our last names were not included in the address. 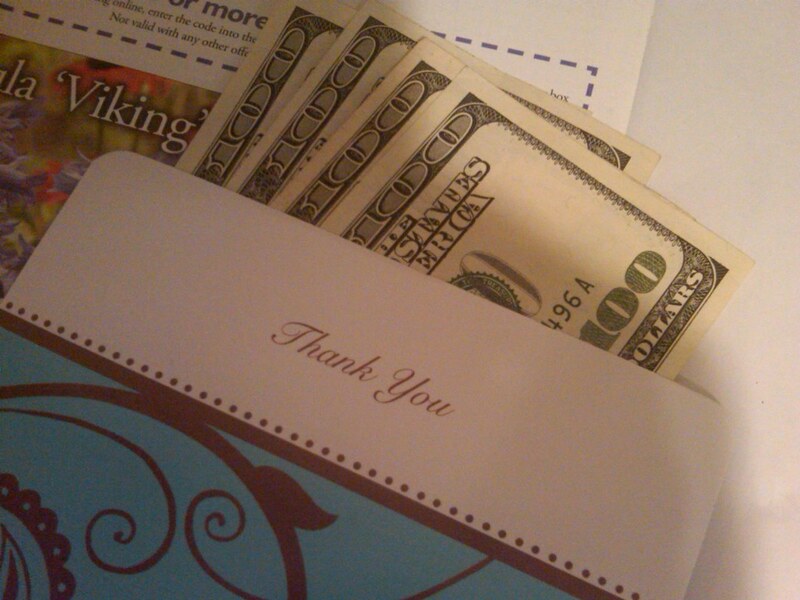 My mind was slowly creaking to deduce the source of the card as I read the "Thank You" on the front. There had not been a recent baby shower, wedding shower or wedding. I could not for the life of me think of why we were receiving a thank you, especially a real card, let alone a token note card sized one. And then I opened it. There'd be no knowing who it was from. The card blank and unsigned, save the imprinted message of gratitude. In my life I've never experienced a moment like that. I was instantly crying as I threw the card to the countertop, quick to cover my mouth with my hand in disbelief. I'm pretty sure you're reading and am almost as sure that I know the source, but can not confirm my haunch. Thank you. Your generosity is amazing and is not without awe. Oh my Leah...I would have been in shock too! What a generous gift! Oh my gosh, what a beautiful story. What kindness.. inspiring. Holy COW. What an incredible gift! I have to say though, I would be terrified to send an unsealed envelope with that much cash through the mail! That is absolutely amazing, Leah! God is so faithful to provide for us - His grace is always sufficient, but sometimes we don't always feel it until we need it the most. I am so inspired by this tremendous act of kindness. What an example for the rest of us! That is so amazing! I want to remember stuff like this or my mom paying my groceries last week. Because whenever we are out of this financial mess we're in...I want to bless others like that. This made me smile! Something similar happened to my in-laws - they got a anonymous generous thank you gift in the mail and still have no idea who it's from. I hope to be able to do something like this for someone someday, too. Wow...sounds like God sent you a precious angel! What a great story! What a generous gift! I love these stories and love it even more to know that it actually happens. The generousity of other never fails to amaze me. So glad that someone was able to give you a little help to make things easier. What a blessing! It brought me to tears too. What a wonderful feeling it must be to have such an incredible, generous person who cares about you so much. wow!! I cannot believe it made it to you with the envelope unsealed. And of course, what an amazing gift! You're welcome. KIDDING! hehe :) What a gift. Love this story. That is amazing, as my husband and I walked through Target right before Christmas a guy handed my husband a card with a $100 Target gc, it couldn't of came at a better time! Um wow, that is totally amazing! God always provides! What a way to provide!!! What an amazing gift. It reminds me of that movie "Pay it Forward." What a generous person. I'm sure they knew that it was going to a most worth person and family.